We all know just how convenient it is sometimes to get great value carry out food – and Little Caesars is a family favorite for a take out pizza. Ever since the first Little Caesars opened in 1959 this innovative take out has been offering fabulous quality, great tasting pizza at a very family friendly price. Did you know that you can get a Little Caesars large, $5 HOT-N-READY pepperoni pizza or large, HOT-N-READY 3 Meat Treat with pepperoni, sausage and bacon for just $8? Those really are family friendly prices! It is funny to think that 50 years ago a take out place was almost unheard of! The concept of a carry out restaurant with no tables and chairs was just not the norm and many thought that the idea just wouldn’t catch on. When Mike and Marian Ilitch opened the very first Little Caesars pizza take out in 1959 many thought that it just wouldn’t work. Well we all know how they have proved them wrong. 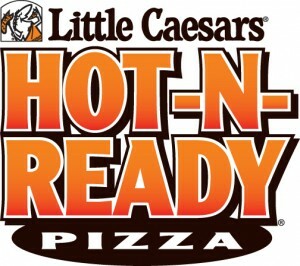 Little Caesars is now the largest largest carry out pizza chain in the world! What we love about Little Caesars is that they are truly vegetarian friendly and that no animal by products are used in the pizza base or sauce! Many pizza crusts and even the tomato sauce on restaurant and take out pizzas are not vegetarian. So it is great to know that we can trust that Little Caesars pizza base is made with a quality, high-protein flour that is vegetarian friendly. The pizza sauce is made from crushed tomatoes and is seasoned with a special blend of herbs and spices. So our vegetarian and vegan family can very happily eat a Little Caesars take out pizza if we order a vegetable pizza without cheese. Just Dance 2 for Wii just $26 Shipped!